AG Barr says it's focusing on 'substantially reducing' the sugar content of its drinks ahead of the 2018 sugar tax. Shares in soft drink companies were hit hard after the sugar tax was announced in this month’s Budget. But if all manufacturers respond in the way that AG Barr is hurrying to do, the impact of the levy could be far less significant than everyone is expecting. The maker of Scotland's favourite lurid orange beverage said it would be significantly reducing the sugar content of its drinks in wake of the news. The company said it expects around a third of its products to be affected by the tax, but that the strength of its brands and adapting its products should help minimise the financial impact. While it has described the sugar tax plans as ‘extremely disappointing’, it does at least, seem to be trying to take the tax on the chin. ‘For the balance of our portfolio which would attract a levy, we anticipate that brand loyalty and consumer preference will drive continued demand,’ said its chief exec Roger White. Nonetheless, he said the firm was moving its focus onto no sugar and low sugar products and ‘substantially reducing’ the sugar content of its drinks to reflect consumers’ changing preferences. That seems like a sensible approach. It has been clear for a while that people are becoming increasingly health conscious when it comes to food and drink. Blaming the regulators for new, restrictive terms is airing frustration in the wrong direction. So AG Barr’s response, claiming to have changes in the works already and that it's listening to consumer demand, is arguably the best way forward for keeping customers and investors happy. It’s always a risk to shift away from what you’ve built your business on and AG Barr is well-known for its sugar-laden drinks. 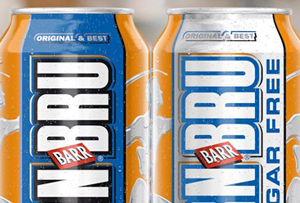 One 330ml can of Irn-Bru contains 34g of sugar (around 42% more than the WHO’s recommended daily intake for adults). But needs must amid tricky market conditions for soft drinks – and Barr does have a range of sugar-free options already on the shelves. All in all, an object lesson in how these health taxes are supposed to work.